We are constantly being reminded to take our re-useable bags to the supermarket (grocery store) but no one ever mentions about those ‘evil’ plastic bags they provide for your fruit and vegetables. Thankfully there are some eco-friendly alternatives just look out for tulle, mesh, cotton bags which can be found online. I have Onya Weigh Bags but they are no longer available. 500 billion plastic carrier bags are used worldwide each year. 10 billion plastic bags were given out in 2008 in the UK. Enough to fill nearly 200 Olympic sized swimming pools. Plastic bags not only litter our beautiful landscape, in flood conditions they block drains and pipes contributing to critical conditions. Even when plastic bags break down in landfill, they never completely go away. The remaining dangerous and toxic particles can still end up in the food chain, putting human and animal life at risk. A huge amount of harmful emissions are emitted during manufacture, shipment and recycling of plastic bags (for those that can be recycled, and many simply can’t). Even paper bags that come from a renewable source and are biodegradable require more energy than plastic bags to manufacture and transport. Did you know that paper cups from coffee shops like Starbucks or Costa are not recyclable? The issue is the difficulty in separating their plastic coating and cardboard to recycle the card. As many as 2.5 billion paper coffee cups are thrown away in the UK each year. I think it's now time for people to start investing in reusable cups. Another huge impact on the environment is drinking straws, they are one of the most common forms of rubbish found on beaches. The good news is if you're unable to survive without a straw in your cocktail then glass and steel reusable options are available. 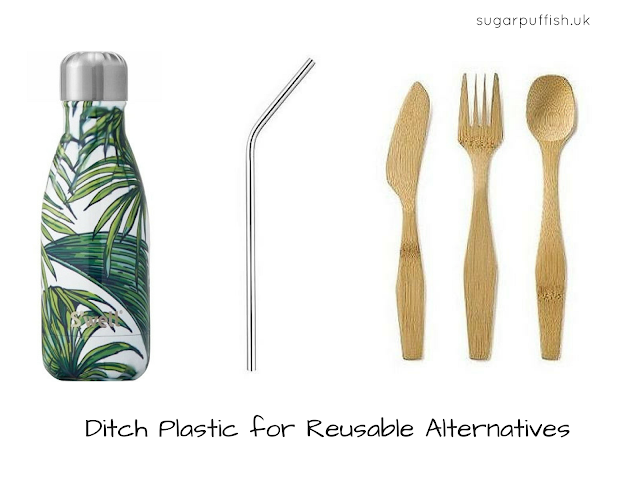 Good news is there are even options to replace plastic cutlery with bamboo ones and sandwich bags for reusable food wraps. I hope this has given you something to think about as plastic is a big problem for our oceans. Reusable items are the way forward so maybe I have inspired you to change your ways? Items pictured above are available from Content Beauty (affiliate link) & Naturisimo. On a side note my title was inspired by a Tim Minchin song.